Summer is in full swing, school's out, and the temperatures are sizzling. It must be barbecue time! As you do your shopping for the weekend's big cookout, you should be adding wine to that supermarket cart. Why wine, instead of the more familiar beer? Well of course, you should be offering your guests a choice, but don't shy away from serving wine, just because it maybe seems a bit upscale for a meal you're going to eat with your fingers. One of the best barbecues I ever attended was in the south of France, right near the border with Italy. We sat in our host's garden, which was bursting with flowers, fruit and vegetables. In the distance, the blue Mediterranean shimmered. We feasted on spicy sausages and chicken, hot from the grill and flavored with rosemary picked from the mountains. Along with this came chunks of home made bread, a huge salad bursting with savory sweet tomatoes and basil, dressed with olive oil and lemon,all washed down with young red wine made by our host from his own grapes, young purple red and loaded with fruit flavors. For desert, peaches, picked warm from the garden wall, bursting with sweetness. Everything had been grown, raised and made on the farm, and that memory as constituted my ideal for a barbecue ever since. The keynote is, whatever you cook, if it's going to be for special guests, rather than just a slung together treat for the kids, you should make sure that the ingredients are of the very best. Go to your farmers' market and buy squeaky fresh salad greens, flavorsome tomatoes, and a variety of home made bread – plus some interesting cheeses for nibbling. Find a Greek deli to offer you the best of olives, dripping and delicious, note to mention extra virgin cold pressed olive oil and fresh lemons for your salad dressing. Think of a country feast for your summer entertaining, and you won't go far wrong. Barbecues offer robust flavors – burgers, steaks, ribs, oily fish like tuna, often accompanied by rich and spicy sauces. 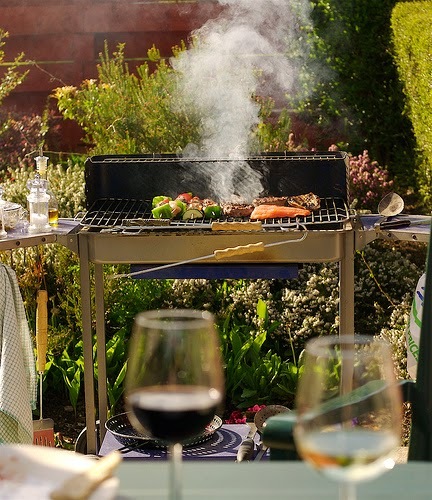 So, contrary to the advice often given for summertime wine drinking, you should turn your back on light florals and fizzes, and instead, wines for barbecues should be big strong reds and hugely oaky whites with a touch of sweetness. The king of summer outdoor drinking is Shiraz, and the queen is Chardonnay. In both cases, look for New World offerings – wines from Chile, Australia and of course, California are amongst the best. 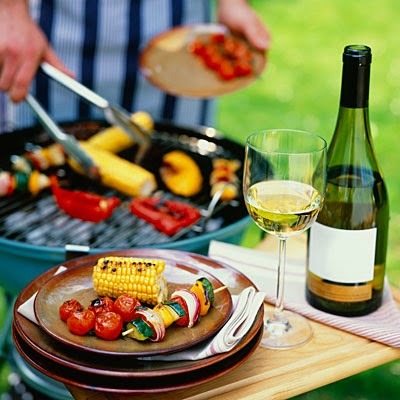 For a particular treat with your barbecue this year, seek out Edna Valley Chardonnay; although not heavily oaked this is a delightfully complex wine with cinnamon notes which I love to pair with grilled chicken. For a very special, expensive treat, look no further than 1999 Noon Reserve Shiraz, with its berry and coffee notes, a massive wine, coming into its best around now, but with room to grow if you care to lay a few bottles down. This wine can stand up to anything, and works brilliantly well with a first class home made hamburger.